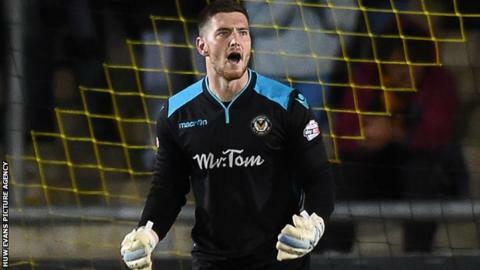 Justin Edinburgh is confident goalkeeper Joe Day will re-join Newport County in a permanent deal in the New Year. Day, 24, has returned to Peterborough United after completing a 93-day emergency loan spell with County. Manager Edinburgh said the club had agreed terms with Day and is confident of finalising a deal with Peterborough. "I do feel Joe will be returning to the club when the transfer window reopens on 3 January," Edinburgh said. "You're never overconfident until it's done but I'm pretty confident it will be secured. "We've agreed terms with Joe and we're near enough done that with Peterborough on the terms as well. "They're being very helpful in the matter and we're not far away." Day, whose Peterborough contract expires at the end of the season, made his final loan appearance for County in their 3-1 win at Bury in League Two last Saturday. Lenny Pidgeley or Jamie Stephens will replace Day in goal for Saturday's game at Carlisle United. "We've got two very good goalkeepers here that I've every confidence in," Edinburgh added. "I've seen them both in training this week and you can see that competitive edge between them. They can see an opportunity now." Edinburgh is now the 10th longest serving manager in the top four divisions following the departure of Mark Yates from Cheltenham. The former Tottenham and Portsmouth defender succeeded Anthony Hudson in October 2011 and is happy with life at Rodney Parade. "I've always said I enjoy coming to work here and enjoy the group of players that I work with," Edinburgh said. "I feel there's a lot more to be accomplished here with this football club. "I'm more than happy to hopefully continue to work my way up the [long serving] charts and be here for another long period of time."